The Flo-Wise monitoring system from irrigation product company provides real-time water rate records. Senninger's new Flo-Wise Monitoring System can keep track of irrigation water flow from a host of sensors, and provides a real-time look and record keeping of flow rates. Designed for center-pivot, solid-set and nursery applications the unit uses free (to users) software to download input directly to an Excel file on a laptop computer. The totalizer circuitry is protected by a locking tamper-resistant body that features a UV-protected display for easy reading without opening. The Flo-Wise is powered by a battery (solar or otherwise) and/or an electrical backup system. 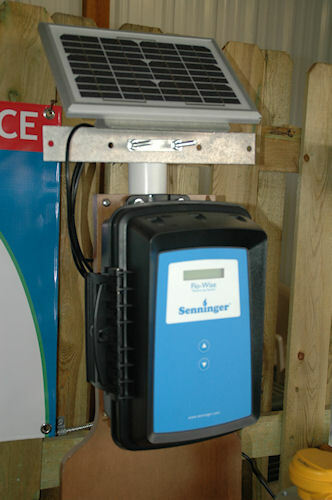 Learn more about the Flo-Wise Monitoring System at www.senninger.com. Senninger’s new Flo-Wise Monitoring System offers accuracy in keeping tabs on flow rates and amounts.